The RIDGID® Model WD1685ND is our 16-gallon MAX CAPACITY wet/dry vacuum. Along with our most powerful motor for the toughest cleanups is a detachable leaf blower, delivering powerful suction and blower in one tool. 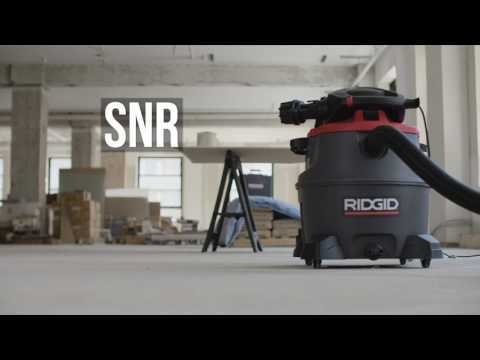 The large capacity, rugged construction, and excellent mobility are ideal for anyone cleaning large, tough messes. Most Powerful 1390 Motor - Highest performance RIDGID wet/dry vacuum. Polypropylene Two-Piece Drum Construction - Rugged construction of durable material that resist kinks, tears, scratches, and dents. Our most durable drum available. 360º Caster Wheels - Provides increased maneuverability when using the vacuum. 60 Litre / 12 Gallon Drum - Cleans up large spills & messes at work-sites and busy shops. 2 Tools in 1 - The powerful vacuum doubles as an equally powerful lead blower, equipping you with 2 tools for the price of one. Includes - Vacuum, owner's manual, 2 extension wands 64 mm x 2.1 m Dual-Flex® Tug-a-Long® Locking Hose, utility nozzle, crevice tool, wet nozzle, Locking Blower Wand, muffler/diffuser, and standard filter. 16 Gallon Wet/Dry Vac is rated 4.4 out of 5 by 14. Rated 4 out of 5 by arbkab from Good buy Happy with product. Good power, haven't come close to clogging yet. Very nice attachments. Only complaints, such as they are, are some of the hose connection tubes can be difficult to get on fully and a bit awkward to pick up to empty into garbage can (not any real good grasping points). But overall very pleased. Rated 5 out of 5 by edddietheyetti from great product glad I got the 16 gal with the extra auto detailer kit included,,this vacuum has great suction and is whisper quite compared to other units. Rated 4 out of 5 by DawgSkool from Diameter hose not big enough for my taste We already own another wet/dry vac by Rigid and love it. This one is a little smaller (the diameter of the hose is smaller) and performs just fine but wish I has bought the bigger one to align with my needs. Overall I would recommend the Rigid brand. Rated 4 out of 5 by keplane from Good for the most part The vacuum works good. My only complaint is that the exhaust port is on the same side as the hose. When you are vacuuming something the exhaust blows whatever you are trying to vacuum all over the place. Could have been designed better, maybe with an upsweep/90 on the exhaust. Other than that it works good. Rated 5 out of 5 by Vizslalover from Great product, great value Excellent product, had my last one for 15+ years! Excellent value for the price. Rated 4 out of 5 by g8037 from overall good product My only issue with the vacuum is that it is a bit cumbersome to take off the top of the vacuum to dump the material in the base. The handle and wheels make maneuvering the unit easy, however the handle gets in the way when dumping. The unit seems to provide adequate vacuum. Time will tell if the unit remains durable which replaced my 16 year old craftsman vac. Rated 5 out of 5 by Horatio from Great product Excellent Vacuum love the Bag option and I will be buying the various nozzles and attachments. Simplified and works great. Would recommend this in a Heart beat.